We shall see Your hand, Your purpose, Your will through all things. “Anyone who welcomes a prophet because he is a prophet will have a prophet’s reward; and, anyone who welcomes a holy man because he is a holy man will have a holy man’s reward. If anyone gives so much as a cup of cold water to one of these little ones because he is a disciple, then I tell you solemnly, he will most certainly not lose his reward” (Mt. 10: 41-42). These are the words of Christ, the Son of God, when recommending his poor disciples to the charity of the people. Doubtless his mention of prophet and the cup of cold water, would recall to the minds of his hearers the story of Elijah and the kind-hearted widow of Zarephath. 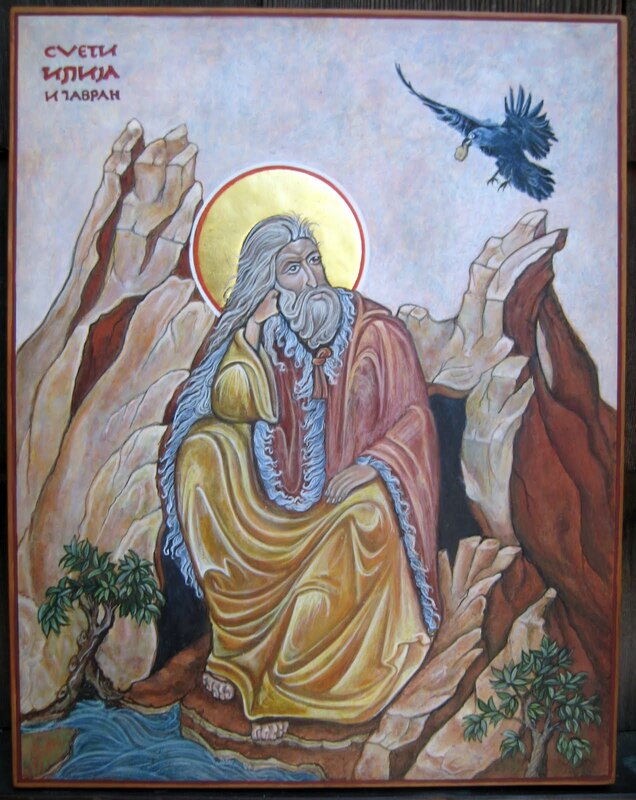 Elijah was one of the most popular and best-remembered prophets of the Old Testament. On another occasion (Lk. 4: 25), our Lord reminded his doubting hearers in his home-town of Nazareth how God sent Elijah to this good widow of Sidon, who was not one of the Chosen People, although there were many widows in Israel then in need of help but unworthy of it. They would not have shared their last morsel of bread with a stranger even though he was God’s representative. The lesson of today’s reading–reemphasized as it is by our divine Lord’s own word–is clear for us. We must be charitable towards a needy neighbor, not only when we have some superfluous goods which we can give away, but even when we have only the bare essentials for ourselves. We are expected to share these with one who has not even that little. But is not this demanding too much of us? Can Christian charity command us to shorten our own lives in order to prolong those of a needy neighbor for a few days or weeks? The answer is very clearly “yes”: we must be ready not only to risk our own lives in order to save that of a neighbor but we must be ready to lay down our lives willingly, if needs be, to save a neighbor. “Greater love than this no man has, that a man lay down his life for his friends” (Jn. 15: 13); this is the ultimate in Christian charity, our Lord tells us. He put it into practice for us and he expects us to be willing to imitate him should the need arise. We are grateful to God that Christ has had followers who fulfilled his command to the letter. They gave their lives to save others. Their noble sacrifice not only earned eternal life for them, but inspired many with a new love for God and neighbor. While making this earth a better place in which to live, it put heaven within the reach of many who would otherwise not have attained it. Most of us will never have the privilege of being called on to make the supreme sacrifice for our neighbor’s sake–but we are all called on to sacrifice some of our possessions to help a neighbor in need. Today’s story emphasizes that we must be ready to share even our scanty means with one in greater need. It also adds that God will not let such charity go unrecorded. The widow of Zarephath and her son could have had one last modest meal before they died of the famine, but her generosity made her share even that little with a stranger. She was rewarded: the little supply she had never diminished and she lived in frugal comfort all through the famine. God can never be outdone in generosity. All we have and all that we are we owe to his kindness. If we show our willingness to share with those who are in want, he will not forget our charity–he will not see us in want. CCC 571 The Paschal mystery of Christ’s cross and Resurrection stands at the center of the Good News that the apostles, and the Church following them, are to proclaim to the world. God’s saving plan was accomplished “once for all”5 by the redemptive death of his Son Jesus Christ. CCC 1013 Death is the end of man’s earthly pilgrimage, of the time of grace and mercy which God offers him so as to work out his earthly life in keeping with the divine plan, and to decide his ultimate destiny. When “the single course of our earthly life” is completed,10 we shall not return to other earthly lives: “It is appointed for men to die once.”11 There is no “reincarnation” after death. CCC 2741 Jesus also prays for us – in our place and on our behalf. All our petitions were gathered up, once for all, in his cry on the Cross and, in his Resurrection, heard by the Father. This is why he never ceases to intercede for us with the Father.16 If our prayer is resolutely united with that of Jesus, in trust and boldness as children, we obtain all that we ask in his name, even more than any particular thing: the Holy Spirit himself, who contains all gifts. 1 John Paul II, RH II. 2 I Cor 15:3; Rom 4:25. 3 I Jn 2:1 Heb 7:25. 9 Heb 9:11; cf. Rev 4:6-11. 10 LG 48 § 3. 12 Cf. 2 Tim 1:9-10. 13 Cf. Lk 16:22; 23:43; Mt 16:26; 2 Cor 5:8; Phil 1:23; Heb 9:27; 12:23. 15 LG 48 # 3; Mt 22:13; cf. Heb 9:27; Mt 25:13, 26, 30, 31 46. The author of the Epistle to the Hebrews is evidently writing to Jews who had become followers of Christ. Again and again he stressed the superiority of the Christian religion over that of the Old Testament which they had left. The Jewish high priesthood, appointed by God through Moses, was one held in great esteem and importance all through Old Testament times, but especially after the return from Babylon–when the high priest became their political as well as their religious leader. It was the high priest who regulated all the services of the Jerusalem temple. On their great annual Day of Atonement, he alone could offer sacrifice for the sins of the people and for his own sins. On that day, he alone could enter the holy of holies–the inner sanctuary of the temple in which were kept the tables of the commandments in the Ark of the Covenant. This Ark was called God’s throne on earth. The Ark was missing from the inner sanctuary since before the destruction of the temple by the Babylonians (587 B.C. ), because the prophet Jeremiah hid it in a cave on Mount Nebo according to 2 Mc. 2: 4-8. The high priest, however, still carried out the ritual of the Day of Atonement. He entered the holy of holies and sprinkled the blood of the sacrifices where the Ark used to rest. This ritual was repeated each year. The author of Hebrews says that Christ, our high priest, was superior in every way to the Jewish high priest, important though he was in the eyes of religious Jews. Christ did not have to repeat his sacrifice annually, his offering of himself as atonement for the sins of the whole world, of Jews and Gentiles, sufficed once for all. His sacrifice, unlike the temple sacrifices, was of infinite value. It was not the blood of goats and oxen that Christ offered to his Father, but the sacred blood of his body which he, the Son of God, assumed in order to become one of us and to be able to die for us. It was not into the inner sanctuary of the Jerusalem temple that Christ sent his precious offering, but into the real holy of holies, the eternal throne of his Father in heaven. Therefore, there is no real comparison between the Jewish high priesthood and the real effective priesthood of Christ. Any effectiveness which the intermediation of the Jewish high priest had, or any value which the temple sacrifices could claim, came to the Chosen People from God’s loving mercy which had the incarnation in view. They were types and the shadows of the real intercession, the real sacrifice which God’s Son would offer not only for the Chosen People of old but for all mankind and for all time. Do we Christians really appreciate the favors and the blessings God showered on us by sending his divine Son in human nature? By the fact of the incarnation we became brothers of Christ and adopted sons of God. This was the fulfillment of God’s eternal plan for mankind. In the meantime sin had entered our world. To atone for the sins of the world the incarnate Son of God willingly accepted to undergo his passion and death by crucifixion so that his heavenly Father would remit the spiritual death our sins merited. Thus we would be able to share in the eternal inheritance which the incarnation won for us. Do we really appreciate the greatness of God’s love for us in planning this eternal future happiness for us and at such cost–the humiliation, sufferings and death of his only-begotten Son? With a future such as this, could we be so foolish as to let anything or any person on this earth come between us and the eternal crown God has prepared for us? Let St. Paul, the man who loved God with every fiber of his being, and gladly spent his life to bring the knowledge of God’s love for us to all the world, answer for us: “I consider that the sufferings of this life are not worth comparing with the glory that is to be revealed to us . . . If God is for us who is against us? He did not spare his own Son but gave him up for us all . . . Who shall separate us from the love of Christ? Shall tribulation, or distress, or persecutions or famine or nakedness or peril or sword . . . nothing will be able to separate us from the love of God in Christ Jesus our Lord” (Rm. 8 :18 ff). St. Paul is in heaven. We shall be there too if we follow his advice. 1 Cf. Dan 7:10; Joel 3-4; Mal 3: 19; Mt 3:7-12. 2 Cf Mk 12:38-40; Lk 12:1-3; Jn 3:20-21; Rom 2:16; I Cor 4:5. 3 Cf. Mt 11:20-24; 12:41-42. 4 Cf. Mt 5:22; 7:1-5. 6 CA 57; cf. Lk 6:20-22, Mt 8:20; Mk 12:41-44. Our Lord’s severe condemnation of those Scribes whose exaggerated opinion of their own importance made a mockery of the religion they professed to live, is a serious warning to all his followers not to look for the praise and esteem of their neighbors when doing their good works, but rather to hope for God’s praise and esteem in the future world. In another context, he said to his followers: “Because of practicing your piety before men in order to be seen by them, for then you will have no reward from your Father who is in heaven . . . when you give alms do not let your left hand know what your right is doing . . . and your Father who sees in secret will reward you . . . when you pray go into your room and shut the door and pray to your Father . . . who sees in secret and will reward you” (Mt. 6: 1-6). It is hardly necessary to say that our Lord is not referring to community prayers or services here. What he is condemning is the hypocrisy of the Scribes, who lengthened their garments and their prayers not in order to give glory to God but to earn the glory of their fellowmen for themselves. Pride was their predominant vice–the vice which caused the fall of angels and of man. It so governed their lives that even their best actions were vitiated by it. There is a strong inclination to pride in every one of us. The reason is that we have great gifts from God and great capabilities; but we are tempted to claim the credit for these gifts and capabilities for ourselves–whereas we owe them all to God’s generosity. A proud Christian is surely a contradiction in terms. A Christian is a follower of Christ whose humility can never be equaled. He was God as well as man. While on earth he emptied himself, as St. Paul puts it, of his divine glory so that he could be like one of us. A follower of Christ should not try to make display of gifts which are not his own, nor try to exalt himself above his neighbor because of something he has which was not given to his neighbor. If Christ wanted to be, and indeed was like the least one among us, we must never try to raise ourselves above our neighbor. Love of neighbor is the second of the two essential commandments–there can be no true love of neighbor where there is pride. The second incident in today’s Gospel story highlights true humility and true charity. The poor widow, forgetful of herself and of her own needs gave her all, her last penny, to help others who were in need. She made this sacrifice without publicity and without seeking the praise of her neighbors. It is this deep contrast between her outlook on life and on religion, and that of the Scribes in the first that connects the two incidents. While the Scribes sought to earn the respect and praise of their fellow-Jews–as well as all the financial gain they could come by–from the practice of the externals of their religion, this poor widow’s religion was practiced in secret and it was to God alone that she looked for any reward that he might deign to give her. We may never be called on to share our last morsel with a starving neighbor but if we are, we must remember that Christ gave his very life for us and has asked us to do likewise, if necessary. It may never be necessary for us to make this supreme act of self-renunciation. If, however, we are sincerely practicing our religion, we must be ever-ready to help a neighbor in need even if this cuts into our hard-earned reserves. The greater the sacrifice, the greater the reward. Pain is a part of being human. Anyone who really wanted to get rid of suffering would have to get rid of love before anything else, because there can be no love without suffering, because it always demands an element of self-sacrifice, because, given temperamental differences and the drama of situations, it will always bring with ti renunciation and pain. When we know that the way of love – this exodus, this going out of oneself – is the true way by which man becomes human, then we also understand that suffering is the process through which we mature. Anyone who has inwardly accepted suffering becomes more mature and more understanding of others, becomes more human. Anyone who has consistently avoided suffering does not understand other people; he becomes hard and selfish… If we say that suffering is the inner side of love, we then also understand why it is so important to learn how to suffer – and why, conversely, the avoidance of suffering renders someone unfit to cope with life. He would be left with an existential emptiness, which could then only be combined with bitterness, with rejection, and no longer with any inner acceptance or progress toward maturity. Lord Jesus Christ, King of all salvation.